Companies send thousands of emails every day, therefore it is vital to ensure that each email displays your brand image as well as the appropriate contact details and disclaimer information. IMEX Signature Manager gives you the ability to centrally control the Office 365 email signature of every employee, whether they are being sent from an Outlook client, webmail or any mobile device which is supported by Office 365.
graphics and advertising banners that can be randomised or targeted to specific recipients. 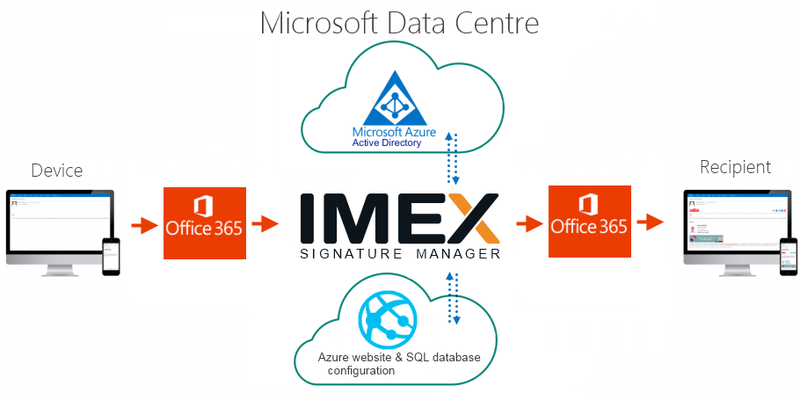 IMEX Signature Manager is hosted within Microsoft data centres across the world, which means that your Office 365 emails will never leave the Microsoft cloud at any point. Your customised email signature is added within a secure closed loop and authenticated by standard Microsoft Office 365 protocols, ensuring that your emails are stamped with your correctly branded, legally compliant and professional Office 365 email signature. Automatically append the correct contact details to every email. To find out more about our Office 365 email signature solution, request a call back today or get in touch on 01793 781800.